DIWA Labs has tested Carl Zeiss Distagon T* 25mm f/2.8 ZF lens on a Nikon D3 camera body. This lens is completely manual so you have to manual exposure mode on the camera and use manual focusing. Since the Carl Zeiss lens was tested on a Full Frame camera it did produce some vignetting at the largest apertures. Read all the test of the Carl Zeiss Distagon T* 25mm f/2.8 ZF lens on the Nikon D3 camera here. 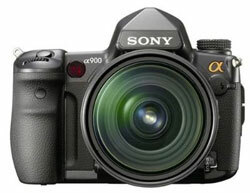 DIWA Labs has tested the first full frame DSLR camera from Sony, the Sony Alpha 900. With its 24.6 megapixel sensor this should be a very interesting camera for everyone who is serious about their photography. DIWA Labs tested the Alpha 900 with two lenses; the Carl Zeiss Vario-Sonnar T* DT 24-70mm f/2.8 ZA and the Sony 20mm f/2.8 SAL20F28. Read all the tests of the Sony Alpha 900 with Carl Zeiss Vario-Sonnar T* DT 24-70mm f/2.8 ZA and Sony 20mm f/2.8 SAL20F28 here. 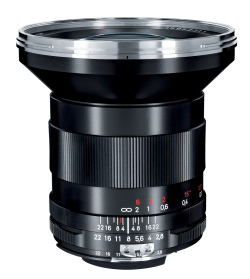 Carl Zeiss has announced that they are releasing a modern version of their high-end wide angle lens, the Carl Zeiss Distagon T* 2.8/21. It has a special type of coating that removes flares that often are a problem with super wide angle lenses. The Carl Zeiss Distagon T* 2.8/21 lens will be released for Canon, Nikon and Pentax mounts at the end of 2008. The estimated price is a hefty 1,399 euros. The shortest possible distance setting of only 0.22 m makes the lens ideal for impressive perspectives. Typical applications include architectural, journalistic and landscape photography. The Distagon 2.8/21 is available with an EF bayonet (ZE), F bayonet (ZF) and a K bayonet (ZK). It is suitable for both digital and analog full-format SLR cameras. Delivery of the Distagon T* 2.8/21 is scheduled to begin by the end of this year with the ZF and ZK version. Its selling price is estimated at 1,399 euros (incl. 19% German VAT). 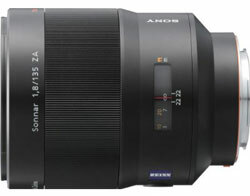 The excellent German website Photozone has reviewed the Zeiss ZA Sonnar T* 135mm f/1.8 (Sony SAL-135F18Z) lens. 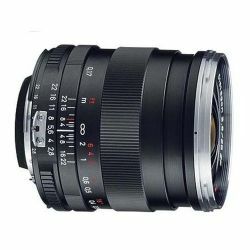 This telephoto lens seems very interesting with its fast f/1.8 aperture. Photozone ends giving the Sony lens a “Highly Recommended” score as the lens is able to produce excellent pictures without any noticeable distortions, vignetting or chromatic aberrations. The only downsides are the high price (but what to you except from high quality optics) and lack of weather sealing. Seems like an excellent telephoto lens if you are looking for a fast alternative. Read the full review of the Zeiss ZA Sonnar T* 135mm f/1.8 (Sony SAL-135F18Z) lens here.